베니스, 이탈리아의 비바베네치아 | 호스텔월드에서 예약하세요. 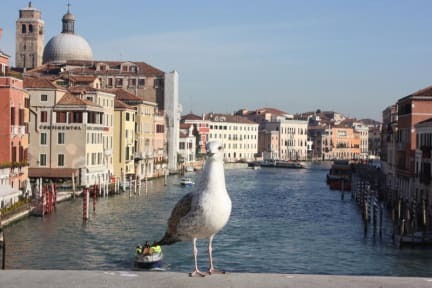 In the cultural and historic center of Venice, Viva Venezia is conveniently located only a five-minute walk from the main train station, Ferrovia Santa Lucia. Viva Venezia is very easy to find and has beautiful spacious rooms, kitchen and laundry facilities, and free internet and wifi. A continental breakfast is included. Viva Venezia is also close to a local vaporetto stop if you want to take a scenic trip by boat up the Grand Canal. Nearby is also one of the most beautiful and vibrant piazzas in Italy, the square that surrounds the Church of San Giacomo dell'Orio. Also less than two minutes away are a large grocery store and some of the best places to eat and drink in Venice. When you arrive, the Viva Venezia staff will give you a free map and information about the main cultural and historic sights to see in Venice. Payment is requested in cash at the time of arrival. When we arrived at the hostel for check in at 9am, the owner asked us to come back after 11am. It doesnt make sense to me because it says check in is available from 8am. However after owner realized that we are super tired, he gave us another house which was super nice. He offers nice breakfast and you can do laundry with 2 euro. Everything was nice :) Id like to book here again, if i have an another chance to travel venezia.